Can I just say how much I love having the internet back? Oh my goodness, I've missed it so much! And though I've been borrowing some internet, it's not the same as having it right here on my desktop where all my pictures are. YAY! Here are a couple cards I made with my new order from Paper Makeup Stamps. This first card is for the PMS color challenge on the PMS blog. The challenge was to use pink and grey. Easy peasy. I love pink and grey. My card uses the Swirlie Tree. Isn't it awesome, I love the swirls and the size of this stamp! My second card uses Panda Hugs. Katie actually contacted me before she made this set because she wanted to make a "You hug my heart" sentiment. Of course, I was over the moon for the thought! I mean, that's my favorite saying and now I have it on a stamp! YAY! And how sweet is this little panda?? Alright, I'm off for a bit. The kid wants to eat. Gorgeous! I love the swirly tree! Wowwy! It is so great that sentiment for the panda works perfectly for you! Sorry I have not been by much lately life has been really hectic!!! I have missed seeing your blog though!!! I love love love that Panda card and the red white and black so good together Love it!!! Your tree card is great too the colors work very good together and I love the tree image!!! So glad you have your internet back. I am still working on my Etsy card I will send it to you tonight!!! Hope you are all feeling well Miss Ashley!!! So FABULOUS!! 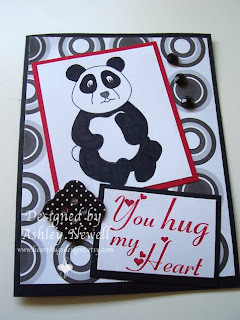 -- I especially love that Panda and the sentiment -- super cute!! these are great! love that panda one! he's too cute!!! I really love the tree card in particular! Beautiful! these turned out fantastic! I hope you're feeling better hun! 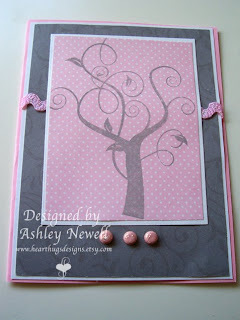 The swirly tree card is just gorgeous! love them both! that first one has convinced me i need the swirly tree too! and the panda is precious! great sentiment! !